Coach Tony DeMeo returns to Option Central's "digital chalkboard" with a new series of Play of the Day Chalk Talks that highlights one of the unique aspects of his Triple Gun Option Offense - its Drop Back Passing game. 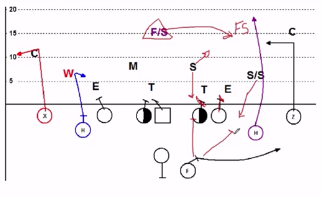 In our first Play of the Day Chalk Talk for 2019, we use a pair of game videos to illustrate two different reads off the Triple Gun's Stretch Pass concept against a 4-4 Cover 3 Defensive scheme. Watch and Listen as Coach DeMeo talks and chalks you through the details of the play using Sideline and End Zone video along with a detailed chalkboard-style play illustration. Adjustments to Press Man coverage and a discussion of the "big on big" protection are also included. Available now in our Member Video Library. In the second of 3 videos from his sessions at the 2019 National RPO Clinics, Rose-Hulman's Nick Davis explains the fronts, line stunts and blitzes that he uses against RPO offenses. Like he did the first session, Coach Davis highlights his opponents' "explosive" offensive plays - this time all runs along with positive plays for the Defense to illustrate the effectiveness of various Defensive calls and emphasize coaching points. Available now in our Member Video Library. Defenses have adapted to the Spread's variation of the Option in a number of ways. Rose-Hulman's Defensive Coordinator Nick Davis approaches this challenge with what he refers to as a "positionless" defensive scheme that uses multiple fronts, movements and pressures with primarily man coverage to create advantagous "matchups" for his Defense. In the first of 3 videos from the National RPO Clinics, Coach Davis uses video of opponent "explosive plays" to introduce his scheme, approach to personnel, formation adjustments and "man coverage" concepts for defending against the RPO. Available now in our Member Video Library. In our second series of videos from the 2019 National RPO Clinic, Coach Rich Hargitt explains his philosophy of attacking defenses, Quick Game concepts like Stick, Snag and Spot, and a number of other Pass Concepts including Mesh, Shallow, 4 Verts and Y Cross. Other topics in this 5 part video include Front and Back Door Reads, Locked and Unlocked RPOs and using Bunch and Compressed sets, Motion, Stack Alignments and Tight End formations . Available now in our Member Video Library. Over 2 hours of instruction. In our first series of videos from the recent National RPO Clinic, Coach Rich Hargitt of Surface to Air System explains his GPS (Game Practice System) and The S2A Read Progression of Matchups, Leverage and Grass. Additional topics include The S2A Defense Identification System and The S2A System Nomenclature. Coach Hargitt concludes this 4 part video with a discussion of his approach to game planning and opponent film review. Neither a running play nor a passing play, the RPO has evolved from a type of play to an entire offense. While its true origin is debatable, there is no debate that a well-executed Run/Pass Option is difficult to defend in and of itself. Even more difficult is when it is part of a "system" that is based on a "stretch the field vertically and horizontally" philosophy. This year marks a significant milestone for Option Central - our 20th Anniversary. That's right, the year was 1999 - a time when the internet was in it's infancy, when Mike Schuster launched what may be the only member - supported football coaching site still in existence today that traces it's origins to the "pre-Y2K" era. You can also read about the evolution of Option Central during the last 10 years in The 20 Years of Option Central . Option Central Contributor Tony DeMeo has published a new course on CoachTube.com. Introduction to The Triple Gun Offense consists of a specially selected group of 17 plays presented in Option Central's Play of the Day Chalk Talk format, along with two clinic-style presentations on the Triple Gun Quick Game and Play Action Passing game. Check out this preview that explains the course content in detail and contains sample video from each of the 5 play areas represented in the course: The Gun Triple, The Double Option, The Play Action Pass Game, The Quick Pass Game and The Triple Gun Screens & Reverses . Click here to learn more about and sign up for the course..
Option Central News is available to both Members and Guests. In each issue, we feature one or more articles, videos and other resources on Option Football as limited-time "previews". Recent issues have included "freeviews" of The Screen Game Webinar recording, Triple Screen and Quarterback Iso Chalk Talk videos, an article on Maximizing Practice Time and eBook Chapters on Mixing Blocking Schemes in an Option attack and the 60 Read Series from the Trap Option 40 Plus 60 Equals Option.